We are here for all your testing needs. A full service sensory evaluation laboratory equipped to meet the needs of the food industry and academic institutions. 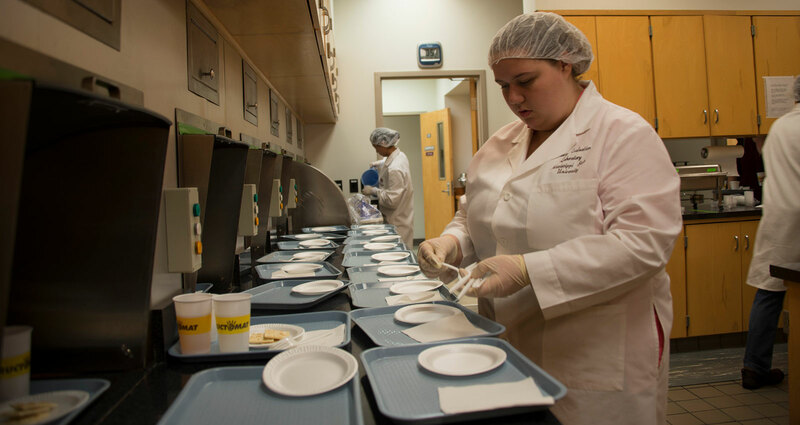 The James E. Garrison Sensory Evaluation Laboratory is a 3,000 square-foot facility, fully equipped with a research and development kitchen, conference rooms for descriptive analyses, and seven booths equipped with Compusense and computers to conduct descriptive and consumer sensory testing of foods. This purpose of this facility is to educate undergraduate and graduate students, to support graduate student research projects, support federal grant funding at the University, and conduct industry testing tailored to meet the needs of companies. In addition, our facility also has the capability to conduct sensory tests on fabrics, textiles, personal care product, cosmetics, etc. Chicken breast, breakfast sausage, chicken sausage, pork sausage, dry cured hams, catfish, prawns, shrimp, steak, barbecue sauce, honey mustard sauce, dairy products, enriched rice, and sweet potato products.